My father was devoted to having the right time. When he wound our mantel clock, he would check it against his pocket watch. To get the right time on his watch he would check it against a railway station clock or one of the clocks that tram drivers used to key into as they left the stop. No doubt there are Freudian theories on this subject, but I used to think my father was attentive to the right time so that he could be waiting for the tram in the morning and prepare for the radio news at night. I now think his devotion to the right time might also have been a hangover from the days when nobody knew the time. Today, people are more likely to check a public clock against their mobiles. We have the right time in our pockets. When Hotham's public clock was set going on 24 May 1879, just on five months after its bells were first heard on Christmas Eve 1878, the right time became visible to the people of North and West Melbourne. More than that the people found their identity confirmed. 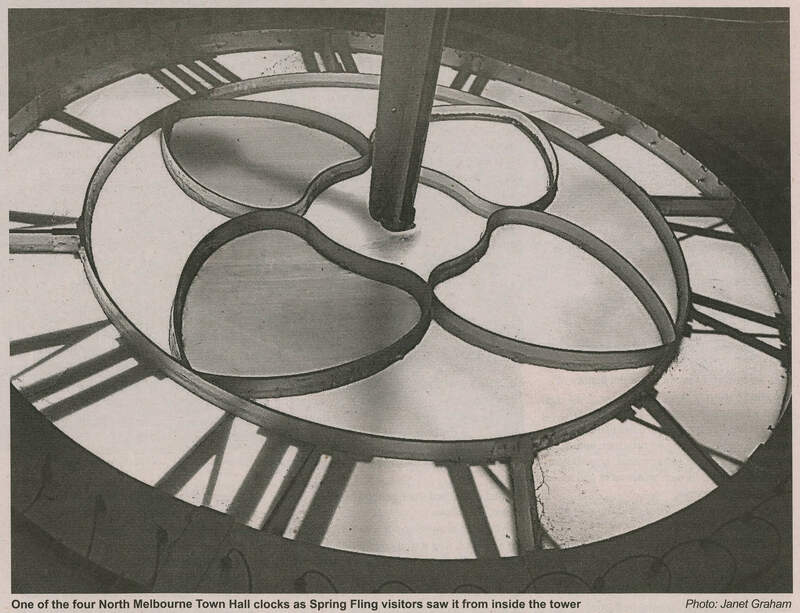 "North and West Melbourne people," said an interviewee to the Hotham History Project, "are defined as those who can see the North Melbourne Town Hall clock." See, but not hear, for the chimes have seldom rung since the clock's electrification in the middle of the 20th century, and then only briefly. In the colony of Victoria in 1879 the man most likely to know the right time was Robert Ellery, the government astronomer and designer of the Hotham clock. Born in Surrey, England, Ellery had followed his father into medical practice, but his deepest interest was in astronomy, which he pursued as an amateur whenever he could. He turned up in Melbourne in 1851, as the gold rushes were about to precipitate the founding of North Melbourne, and barely 18 months later, reports The Illustrated Australian News for Home Readers of 25th April 1868, he "was invited by the Government to establish and manage an observatory at Williamstown for the purposes of commercial astronomy". "This office he accepted and has held ever since, first under the title of Superintendent of Observatory, and since under that of Government Astronomer. In 1854 the Williamstown end of the Melbourne and Williamstown telegraph line, the first erected in the colony, was placed under his charge in addition to his astronomatical duties. In 1858 he was appointed to superintend the geodetic survey of Victoria ... He was elected Fellow of the Royal Astronomical Society in 1857; President of the Royal Society of Victoria in 1866; and re-elected in 1867." Clearly an amateur no longer. Ellery's appointment to the Williamstown observatory tells us most of what we need to know about the conquest of the right time in Victoria. In horse-drawn days, news of the world arrived by coach and the coach moved on when it had all its passengers, the last of whom would dash from the pub. Williamstown, however, had our first colonial railway line. Trains need standardised time and a way of knowing what it is, otherwise, they're apt to collide on shared lines. The first examples of standardised time are known as railway time in both Great Britain (1840’s) and the USA (1883). Railway time was not always welcomed local time would be displayed beside it and the likes of school committees disciplined for wanting to adopt it. Further, we see that the Williamstown line was connected to the telegraph. The stationmaster waving a telegraph is a familiar scene in Westerns, for America was undergoing the same revolution in communications. Eventually, various versions of railway time morphed into Greenwich Mean Time (GMT) and successive versions of universal time, finally arriving in our own pockets. The plaque that Spring Fling climbers to the tower see on the massive clock mechanism, names, along with the councillors of the day, Ellery as its designer and Thomas Gaunt as its maker. Gaunt had a famous jewellery shop in Bourke Street where a large clock and a weather report that was also printed daily in The Argus provided Melburnians with a way to check their watches and prepare for rain. Though a landmark watchmaker and jeweller, Gaunt left his mark on many public clocks and on the chronometers that give official times at racecourses around the world. Ellery thought his design compared with the best in the world. Gaunt was a master craftsman. All of this story tells us why Hotham Council was determined to have the best of clocks despite the very substantial cost it added to the town hall building, whose incorporated post office would receive the right time from Mr Ellery. The clock mechanism and bells alone added at least a 10th to the building cost, without allowing for the cost of the tower itself A small price really for bringing North Melbourne into the modern industrial, punctual, mobile age. Bill Hannan is an author and member of the Hotham History Project, 2014.